Great characters in a tight and interesting story all presented in a slick fashion. BioWare make the best RPGs because they deliver on these aspects consistently across their titles, and ME2 certainly delivers in this regard. BioWare have excelled themselves here. 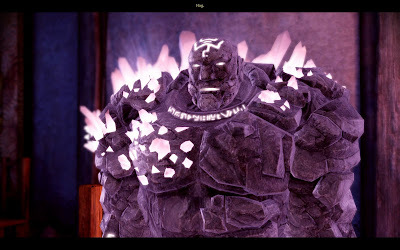 The truly wonderful thing is the number of decisions from ME1 that you see pop up as you explore the universe in ME2. Some of them are simply emails you receive from individuals, but there's plenty of returning characters that reference your previous actions involving them. It's a small thing, but it makes the continuity across the first two games of this series better than anything else out there. The FPS nature of the game has really been stepped up by several notches, and it really does deliver. But this is no plain shooter where you just gun down your enemies. 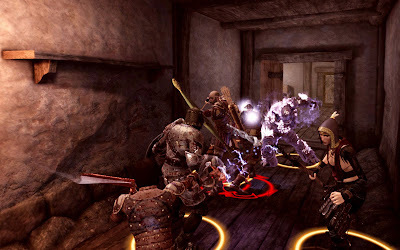 Like any good RPG, tactics are still required, as you can (and must) use several different powers at your (or your teammates') disposal in order to take down enemies. However, it's very easy to set these up and use them in the midst of a firefight. There's no need to pause like in ME1, which keeps the action going very nicely. Slick, pretty, and cinematic. Graphics have been amped up a notch, and the texture pop issue of ME1 is gone. The voice acting is also excellent, though there are a couple of characters that are a little too melodramatic. An asari on Omega is probably the worst case of this. This is a bit of a downer, even though ME1's inventory system was one of my most disliked GUIs for a long time. Yes, this is a much more action oriented game, but I'd like to have more variety in my gear. But barring that, I really should be told the differences between my available weapon choices. For example, the first new heavy pistol I picked up has a significantly reduced amount of ammo I can use. But this isn't listed anywhere. And how many extra damage am I doing per shot with those fewer bullets? ME2 comes on two discs, so I decided to install both discs to my XBox Hard Drive to avoid having to switch discs. No dice. It still asks to switch disks every now and then, even though all the data should be on the HD. I haven't had to switch discs since the C64. I really don't like this. We're not in the early 1990s. Personally, I think this should be on the "must fix ASAP" list of issues. Well, BioWare listened to the complaints about resource gathering being dull, but seemingly missed the point of why. The tedious process of clicking on planets in the map and hitting a button to scan or driving across the planet in the unwieldy Mako has been replaced. Unfortunately, it has been replaced by an equally tedious process of continually holding down the left trigger (on the Xbox360) while you move the thumbstick methodically across a planet's surface and occasionally hit right trigger to mine resources. This was fun for the first couple of minutes... but having to do this for several mind-numbingly boring minutes for each planet gets very old, very quickly. I haven't yet finished the game, and might write up something more detailed once I'm done, but these are my thoughts on the game so far. Part 3 in a series of post about DLC/Add-In integration. This is more a point for home modders rather than official DLC, but it's important. Maintaining coherence and consistency in an RPG is vital in keeping the player immersed in a believable gaming world. There is a delicate balance to tread in order to cover new ground while not producing something outlandish that clashes with current or future content. If you're going to writing a mod that deals extensively with the Dalish elves, make sure you've read the Codex entries on them thoroughly to ensure you understand their history, plight and beliefs. Likewise for other settings or groups. If you're having established NPCs participate in your adventure (as per part 2 of this series), then you need to ensure that those reaction are consistent with their previously established character. Leliana, for example, should not be happy if you're denouncing the Maker or killing helpless innocents. Likewise, Morrigan will not be pleased if you start cowing before Templars or go about helping those unable to help themselves. Perhaps the only means to break the established lore or have characters stating conjecture as fact, is if the character providing this information is intended to be an unreliable - perhaps a lunatic or zealot? By all means, make up events and new characters and stories, but reviving dead characters, making bold statements about history, culture, religion or otherwise conflicting with official content will just make your Add-In seem out of place. Alley of Murders has been released! It is now available for download on BioWare's social site. Please download it, make it popular and spread the word! 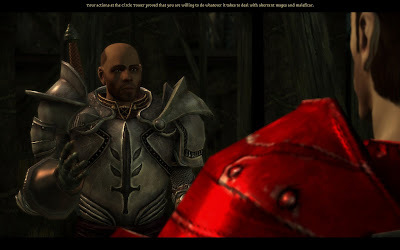 Part 2 in a series of post on how to make DLC/Add-Ins more integrated into Dragon Age: Origins. The player travels with a party. It is only natural that they will have opinions on decisions you make. This was done very well for the game itself, and the Stone Prisoner DLC is a great example of integrated DLC in this regard. Though I love Shale's dry wit, so I might be biased here. VO from companions is something that the developers can do, because they have the money and clout to hire voice actors. I'm guessing that the majority of modders don't have access to Claudia Black, Steve Valentine, Corinne Kempa, et al. However, we do have access to all the VO content used within the game. It is possible to track down lines that can be re-used or cut and re-arranged to form new interjections. It's a very time consuming process, and sometimes you need to do some rewriting of your content in order to make their lines fit, but it is possible. It might be a small thing, and perhaps won't be noticed by everyone because they don't make choice X with party member Y present, but for those that do get those responses, it will likely make a big difference. So in designing an Add-In for Dragon Age, one of the questions I asked myself at the start was: "How can this be integrated into the main campaign?" Given I'm currently having a closed beta for Alley of Murders, which means release is very close, I might add, I thought I'd offer my thoughts on how I did this. I was not about to change a major part of the story for Alley of Murders, but I still wanted to have it so that it felt like a cohesive part of the game as a whole. So, the question remained of how to achieve that. I am sure this is something that the developers themselves wrangle with for DLC releases, as they want them to add to the whole story of Dragon Age Origins, while at the same time avoiding a "tacked on" feel that you get from some DLCs. So over the next few days, I'm going to raise a few points I feel I'm going to list a few things that feel are required to make a DLC great, here are a few thoughts to help it mesh with the entire game. Some of these points are more generally applicable in RPG games in general, but I feel that an extra effort might need to be made for DLCs. The Grey Warden makes many decisions during their adventures in Ferelden. The fact that these are remembered by NPCs in the world is a big part of what makes the storytelling in Dragon Age so rich. If NPCs in a DLC also know about major events (or events to which they would be privy), then it helps reinforce that feeling that their decisions have a real impact. Anyone who has played the game knows there are a number of meaty decisions the player makes that have some serious ramifications for the future. NPCs know about these, and in some cases, will judge the player for them. Some NPCs might support the player's actions, whereas others will dislike them. You don't necessarily have to present both angles, but at least presenting one will make the player's experience more immersive. Remember that this doesn't just have to be major decisions. Perhaps a relative of one of the people involved in a small sidequest might become involved in another plot. depending upon how the player solved the sidequest (or even if you didn't do it at all) might affect how that person interacts with the player... Perhaps one of the most obvious is to refer to the player's origin story - a Dalish is going to be treated quite differently to a human noble. The majority of my work on "Alley of Murders" has been bugfixing and VO. So basically this means playing through the module with a pen and paper handy and noting down everything that doesn't work exactly as I'd wanted, or anything that doesn't seem quite right. This could be a plot helper icon not popping up (or displaying when it shouldn't! ), a small typo in a sentence or quest journal, or a real bug where pursuing a quest in a certain way causes continuity issues. But I think most of those have been done now, so the only things I still want to do are a few minor cosmetic touches here and there, be it an extra short cutscene for a sentence or a few changes to the sound or ambiance. The other major time consumer that has been taking up my time is voice acting integration. As my wonderful voice actors start have been sending me in their recorded lines, it's been my task to get them in the game. There can be a little bit of work doing post processing on the sound here and there: simple format conversion, a little bit of extra noise filtering, or adding/removing pauses in sentences, or renaming the files to the correct line number. After this, it is on to doing the real integration in the toolset. Automatically generated poses and gestures are excellent base for conversation animations, but you will often find you want to tweak them for important lines. Any line that is more emphatic is a good candidate for manual control, to give the line more impact. Any key lines that the player has to see (for plot reasons) are also good ones to tweak. While it's not necessary to preview every line in the toolset (and indeed, for large modules, this would be quite impractical), I would recommend doing it for any lines that have considerable pauses in a sentence. This is because it is entirely possible that an NPC will be gesturing in the middle of a pause in speech, which does not at all look good by virtue of being an immersion breaker. 1: Always have a blend in and blend out time set on your animations. I would recommend at least .25, if not .5 for every animation in order to avoid jerky movement. 2: Avoid animations that extend past the VO length for NPC lines where they also speak the next line. Increase the end-offset to stop the animation name from being red to fix this. Again this is to prevent choppy character movement as the character automatically jumps from their position at the end of one node to the beginning of the next. This is potentially alleviated by the automatically generated cameras (which frequently zoom in for NPC monologues), but you may want long shots during these exchanges too. Finally, for those who may not have already seen it, I posted a trailer on Youtube for Alley of Murders.